Ryan checks out the show to mainly see what work Faile shows... turns out older work "The classic designs where all there probably making room for their newer more dimensional presentations to be in the solo show to come early in the new year." When I got to the gallery early Tuesday night the Teresa Margolles Wall was just being laid with foundation. 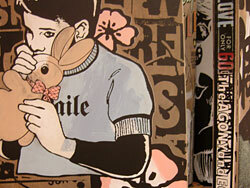 The turnout was rather small due to the Tuesday it fell on, but Faile's work drew in a crowd of its own. I was impressed by the older work that adorned the Apple Boxes more commonly used on stage and screen as grip. The classic designs where all there probably making room for their newer more dimensional presentations to be in the solo show to come early in the new year. The other artist that caught my attention was Robin Rhode who does these incredible live action montages where he interacts with his drawings and expressions in a 3 dimensional space that is composed into a 2 dimensional flat image. It was so fascinating, like much of the work produced by Michel Gondry without a commercial direction.